UK police and government officials are considering a plan to block the sale of small mobile phones designed to look like car key fobs after confiscating an increasing number of the mini-mobes from prisoners. "A range of techniques – including body orifice security scanners and high-sensitivity metal detectors – has seen the [overall] number of recorded seizures increase," a prison service spokesman told the BBC. "We're now working closely with the Serious Organised Crime Agency (SOCA) and Trading Standards to remove these small mobiles from sale in the UK, as well as legislating to block phone signals in prisons." The National Trading Standards Board has also asked British retailers to stop selling the tiny telephones. It also points out that such small devices are "electrically unsafe meaning they could cause fires and injure consumers through electrocution." Last year, prison officials confiscated 7,000 phones and SIM cards from prisoners in England and Wales last year and the handsets are no doubt popular with prisoners who have been smuggling painfully large devices and their chargers. 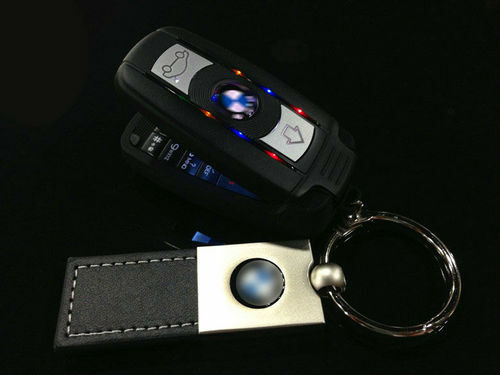 "The latest key fob mobile phone has the potential to increase the number of mobiles in prisons simply by the nature of the design and size," said a spokesman for prison officer's union POA. "The POA believe all prisons should have blockers installed and prisoners found in possession of a mobile phone should be prosecuted." There's a healthy market for mobile phones in prisons, partly for privacy but also to avoid cripplingly high charges – a 15 minute call costs $17 from some US prison payphones, and that's a lot of laundry duty. SOCA is taking the unusual step of asking motor manufacturers to get involved and try and stop the trade in such phones by enforcing their copyrights or trademarks over counterfeit devices.